After quickly turning around, Rob walked up to the window. He spoke with the owner, who had just one small problem with selling the Eames chairs—it would leave his customers without a place to sit! Rob went to a nearby store, bought new chairs for the taco truck and promptly brought them back. Upon further conversation, it was revealed that the taco truck owner had about 100 more Eames chairs. “He opens up the door to the storage unit and the whole thing was filled top to bottom with Eames fiberglass shell chairs,” remembers Rob. After purchasing all the chairs, Rob called his friend Mike from Tomorrow’s House—one of Rob’s favorite stops for midcentury items. They worked out a trade that ended with Rob acquiring an Adrian Pearsall couch. Coming across a Craigslist ad for a Noguchi coffee table is quite a stroke of good luck. When this happened to Rob, he was even more elated to learn that the seller had worked for Herman Miller and bought the piece as a floor model during her decades of employment. 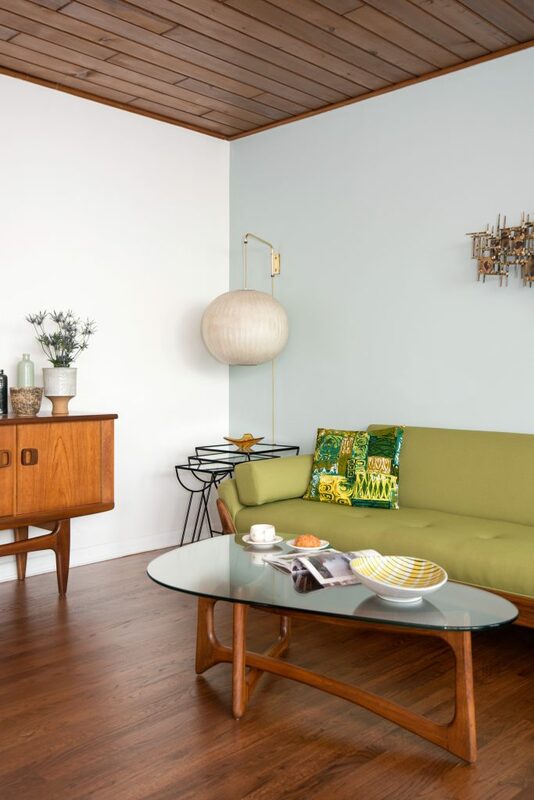 “I ended up trading the Noguchi table with Mike (along with a George Nelson sling sofa) for a Brazilian rosewood and black leather Eames Lounge Chair,” says Rob. An original Philco Predicta TV had been on Rob’s wish list for some time. When he spotted one at an antiques shop, Rob promptly made his way to the counter. The store owner mentioned a Craigslist ad for a few more Philco sets being sold in the area. “I rushed over and got two more originals.” In a single day, his Philco collection suddenly grew from 0 to 3! Before making mailboxes, Rob dabbled in furniture design. 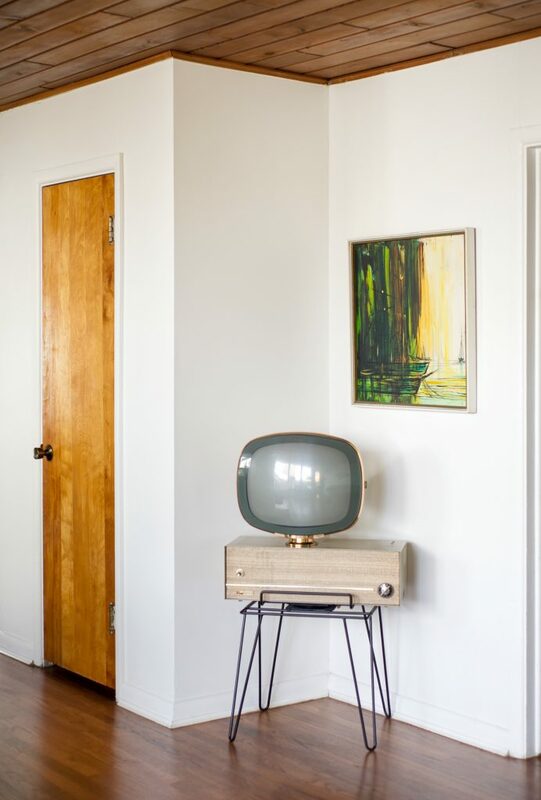 “I wanted to be able to design and fabricate affordable Midcentury Modern pieces [because] ten years ago you couldn’t.” After partnering with a local shop, an entertainment center prototype was ready. Ultimately though, Rob found that vintage stores began importing sturdier vintage pieces and thus the idea was shelved (pun most certainly intended). Perhaps it worked out for the better, as Rob later came to create Modern Mailbox. Midcentury Modern Furniture Picking Tip! 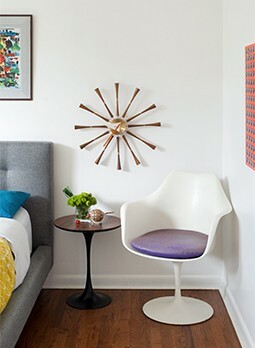 Often using Craigslist as a resource for finding his unique furnishings, Rob reminds other midcentury hunters that you can post an ad on the site requesting a certain piece. It was through this avenue that a Wendell Lovitt fireplace came into Rob’s possession.